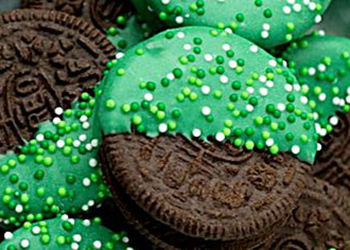 St. Patrick’s Day Desserts! It *is* easy being green. If you’re not ready to color tonight’s dinner green, save the emerald edibles for dessert! Here are a few ideas for some lucky post-mealtime treats. Whether it’s green candied popcorn or popcorn with candy in it, you can’t go wrong with these two colorful options. Click on the image to see instructions on how to make these delish treats. Green milkshakes are great in any season but this copycat Shamrock Shake recipe or the Jr. Mint candied version will make you forget your faulty Leprechaun Trap woes. Click on the images below for recipe instructions. Drop some food coloring in any light colored cake batter or frosting to create a St. Patrick’s Day inspired look. Or, try hitting up your local grocer or Walmart for some St. Patrick’s Day sprinkles for decorating (photo on left) or getting the gummy Airhead Extremes (photo on right) for the rainbows. 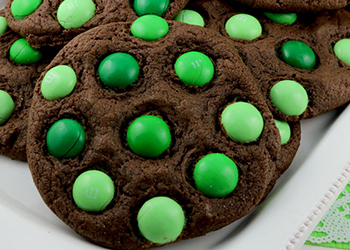 Dipped Oreo’s or M&M cookies definitely say St. Patrick’s Day (why not?)! Click on the image to see the recipe. Go healthy with a bowl of sliced green grapes, melon, kiwi and green apples. Or, how about a cool, colorful, edible rainbow! Do you have some other GREEN ideas? Do share with us! Previous PostGotcha! How to make the *best* Leprechaun Traps! Next PostPEEPS S’Mores Easter Treats. Yes, please! Great ideas!!! Just in time, thanks!